With the 2018 release of her first recording of originals, a look back. Two qualities that distinguish enduring jazz vocalists, beyond the ability to sing in tune, are the character of the voice and phrasing. A great contemporary example is Karrin Allyson. Allyson's current tour, which comes to Catalina's Jazz Club this week for three nights October 11, 12 and 13 [Tickets], comes on the heels of a new release of new material. Some Of That Sunshine is her first album devoted exclusively to original material. Allyson's distinctive sound is instantly recognizable. There's a unique timber that, beyond signaling the arrival of a familiar presence, aids her storytelling and emotional truths by securing a sense of intimacy with the listener. The many singers who have risen to popularity with this feature range from Billie Holiday to Randy Crawford and beyond. Phrasing is what turns a singer into an artist. Like stage actors who make memorized lines sound spontaneous, singers like Allyson allow tunes going back to Berlin to be reborn with each delivery. The supreme example of this is Sinatra, whose way around a lyric line is unmatched. Here in October 2018, Allyson's website is coated in Sunshine promotion, including a two-minute clip of track excerpts. The personnel are Allyson supporting her vocals on acoustic or Rhodes piano, with Miro Sprague on those instruments, Chris Caswell on Hammond B-3 and accordion, Jeff Johnson adding bass and Jerome Jennings on the drums. Bass legend Lee Sklar joins in on "One of These Days," and there are appearances by violinist Regina Carter on the title track as well as "Time is a Funny Thing" and "Big Discount," and the great saxophonist Houston Person on three of Allyson's songs: "Right Here, Right Now," "Just as Well," and "Nobody Said Love Was Easy." 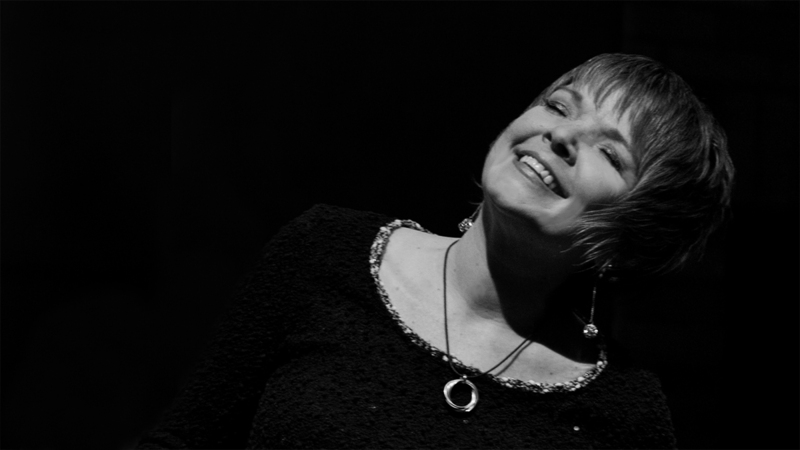 Since her debut in 1992, I Didn’t Know About You on Concord, she has earned five Best Jazz Vocalist Grammy nominations: 2015's Many A New Day: Karrin Allyson Sings Rodgers & Hammerstein, Ballads: Remembering John Coltrane (2001), Imagina: Songs of Brasil (2008), 'Round Midnight (2011), and Footprints (2006). It was shortly after the release of Footprints, the tenth of her 15 highly acclaimed recordings, that I interviewed Allyson for an Orange County Register profile. We spoke at length about her career and choices. Here are excerpts from that conversation. You have such intimacy in your singing. Is it something you have to think about? It’s not something I think about on stage. Not something I’m aware of. It’s like I’m going back and telling the story as best I can. I do want to leave some of it open or up to the listener. I feel like over-emoting is really is not to my taste. I try not to do that. But it’s funny because people really think they know you, but they want to be your best buddy on the break. You might as well open with them on the stage. I don’t feel there’s any danger in being too open. Your roots were originally Kansas City? I’m mostly a Midwestern girl. But I’ve been in New York for six and a half years now. But I’m well traveled. I did live in the Bay Area for a while when I was in high school and then came back to Omaha and got my degree at UNO, in classical piano performance, and then moved to Minneapolis and did some stuff and back to Kansas City to do some stuff, which is where I began to record. My uncle had a club there. My father’s brother. He hired me to appear there and I ended up just staying. Are there musical traditions in Kansas City that have helped define your unique talent? I think so. I think it’s pretty intangible, but there is sort of a Kansas City style. I think it’s blues and riff based and I think I absorbed that, unconsciously. You just do it. It’s different than the West Coast and New York, East Coast I should say. It’s hard to describe, but it’s rather uncomplicated. Has being a pianist that sings been an advantage in your growth? It’s meant everything. It’s my first love. I don’t get enough time to spend with it. I still play on gigs, which is nice. It makes you feel grounded, I guess. That’s one way to put it. I’m a self-taught jazzer, meaning I didn’t take many lessons for jazz. I took a lot of lessons for classical. So, I've learned a lot from the folks I work with, just by doing it. [That way], you learn the language and you start working sooner. I did a lot of piano vocal gigs when I first started. You learn all these tunes and it’s just you sitting down at the piano and singing for five hours or whatever. That’s a heavy-duty school. And there’s always so much to learn. It’s such an intellectual art and yet it’s so pure. That’s what I love about it. You can use your mind, your sense of humor, and your heart and your soul. Everything. I have a tune that I sing called "The Duck" on our cd From Paris to Rio and it’s a tune that Jon Hendricks wrote the lyrics to. It’s just become my tune and folks won’t let me out of the place without me singing "The Duck." Do you play much in Southern California? I’ve played in L.A. for years. I’ve played at Catalina’s for years and other places and Steamers in Fullerton. Played several festivals out that way. I feel really at home with the L.A. audience. We have our favorites, but I feel like this place may become one of our favorites. For one thing they had us booked for one night and it sold out so they booked a second. So that’s a cool thing. I already like it. I love the saxophone of James Carter and he’s on your Coltrane lp, the Grammy-nominated Ballads: Remembering John Coltrane. He plays it on "Say it Over," "All or Nothing," and "Naima." It's a great way to bring audiences to these other artists through your songs. Oh, I want to do that. Sure I want to do that. Speaking of introducing people to other musicians, when you look into your audiences, do you see young people in the mix? Yeah. For example this week we’re playing at Dizzy’s at Lincoln Center in New York and there was a whole – and this is different because they were music students – but there was a whole choir like on the second set. Nobody knew. Fifty people from Ontario, Canada came in and they were young kids. And some times that kind of thing happens. But I do find that our stuff, that jazz is real attainable for everyone. It’s just not out there. You know? But when people hear it, you know, babies move to it, toddlers like to dance with it. We were also at Yoshi’s about a week ago and Sunday afternoon they have a matinee for kids and parents and the kids were groovin’. And I had Jon Hendricks and Nancy King with me and these guys are older, but it doesn’t matter. I find it timeless. And I think that if we were just out there more it would be more accepted. I grew up with '70s composers and singer-songwriters, and you've dipped into those waters. What attracts you to those songs, or any of your choices for that matter? It’s kind of a mystery. You could say the lyrics; you could say the music. You could say both. Just the other day I was talking about this to Nancy, who's on Footprints. And, I said somebody will suggest a song to you and you’ll think, "Ehh, that’s not really right for me." And then maybe a year later you’ll think, you know I want to start doing that tune. So, it is kind of mysterious. But I think you have to feel that possibly you have something to say with it: That you can relate to it and then have a story to tell with it.